Aeration is a vitally important sports turf operation to introduce air into the soil and let nutrients reach the grass roots. Grounds professionals need to use a machine all-year-round to keep playing surfaces in peak condition. The Javelin Aer-Aid 1500 from SISIS is one such machine. 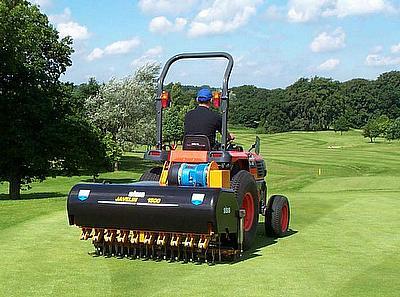 However, it differs from others in that it not only aerates with a vertical action, but also injects air into the root zone at a fast working rate, creating thousands of fissures. The cam trigger mechanism ensures that the air is always expelled at the bottom of the tine penetration, enabling treatment to be targeted precisely and consistently. The overall result is the reduction in the need for Fertilisers & Pesticides. 10mm diameter ‘tipped’ tines are spaced at 75mm (3ins) with depth of penetration, infinitely variable, to a maximum of 127mm (5ins). These air injection tines are specially designed to use the maximum air available from the compressor and produces clean, fresh, air at a constant rate of 88 litres per minute. Surface disturbance is kept to the minimum after operation. The Javelin Aer-Aid 1500 has a working width of 1.5 metres, and is very quiet in operation. It can be powered by as little as a 30hp tractor keeping the compaction of the surface to a minimum. Used at the correct speed and depth, it can aerate a typical football pitch in just three hours, and an average golf green in under 25 minutes, leaving an even finish that can be played on immediately afterwards.